Skating has been a practical mode of transport and recreational activity for over a thousand years. It is believed that the Vikings, using polished and ground reindeer bones, were the first to develop skating, mainly as a method of transport during the harsh winter months to cross frozen lakes and rivers safely. During this time, it also appears to have become a recreational pastime, as well. Today, skating has evolved to include wheeled, land-based skates, as well. Rollerskating and rollerblading are the two most common forms of land-based skating. Roller skates feature four wheels, paired two by two, on the base of the boot. 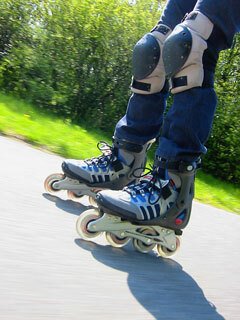 Rollerblades, or inline skates, have four or five wheels in a single row. Rollerblades also have a rubber brake situated at the back of the skate, unlike roller skates, which have a stopper at the front. Ice skates use metal bladed skates, often with a series of notched grooves at the front to facilitate braking. Ice hockey skates are booted differently, usually in a hard plastic or polymer, because of the increased punishment they take during use. For figure skating, the skates are the only pieces of equipment normally needed, although skate guards are also available to protect your edge while moving about on substances other than ice. Secondary equipment is available for those rollerbladers who really go all out and make the sport extreme. New, high-speed bearings can replace your stock models to decrease the friction of your wheels. Grind plates can be added to your boot so you can perform tricks without damaging the actual boot itself. New polymer wheels are also great, as they categorically withstand wear better than stock wheels. This California distributor features inline skates, parts, and wearables. Designer and innovator of in-line skates and accessories. Minnesota-based firm features innovative, technically advanced skating boots, blades and roller products. Ontario-based supplier of figure skates, ice skates, and blades. Offers a wide range of inline training, recreational, and junior skates.